Adding interest with container water gardening is fairly easy to achieve for most gardeners and lack of space is not a problem. And, with many people enjoying the fragrance and beauty of aquatic flowers and plants, visitors to your home are sure to appreciate such a visually interesting garden. You may opt to have free-standing containers with your water plants, or feature them within a bigger water expanse. The containers can be as unique and diverse as the plants themselves. Many people have found success using the traditional terra cotta pots or plastic pots. Some more creative ideas are half whiskey barrels, large bowls, or old-fashioned galvanized tubs for a larger design. Whatever style of container you choose to use, it should be about a foot and a half deep and measure at least 18 inches across. To be sure it will hold enough water to keep the plants healthy, choose a container that will hold 5 gallons of water. The next step to creating your masterpiece is to choose your plants. Like with any floral arrangement, varying colors and heights result in visual interest. Just make sure you don't overload the container and make your creation too busy. Everyone trying container water gardening should try to create a focus point. Good plant options for this are dwarf lilies or teacup lotus. Both of these water flowers produce a lot of blooms. Floating plants are always interesting to look at and you may want to include one of these as well. Good choices are fairy floating moss, water lettuce, and water hyacinth. Another benefit to using floating plants is that they help control algae and any floating debris. For height in your arrangement consider adding cotton grass or cattail. To ensure your aquatic plants get enough sunlight, place the container in the sunniest spot on your deck, patio, or balcony. These plants will need between 4-6 hours of sunlight daily. Try to keep the container away from falling leaves and other debris. High winds should be avoided as well. While on the subject of where to place your new creation it may be a good idea to put the container on bricks or blocks. This both draws attention to the container and allows for adequate water drainage. 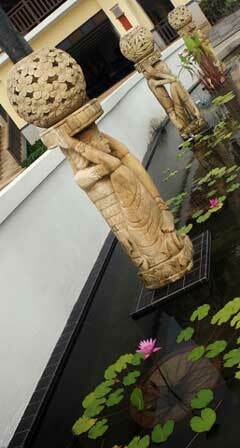 Aquatic plants are a unique addition to your landscaping. It isn't necessary to install a full sized water pond to enjoy these plants. Container water gardening provides the same beautiful display without the need of a lot of space. Low maintenance, affordable plants and flowers, and enjoying your creation are all excellent reasons to give this gardening a try! Note: We'd love you to send us your pics of your container water gardening to feature on our new pages!